Located in Upstate South Carolina in Oconee and Pickens County, Lake Keowee offers the very finest in luxury lake living. In addition to Lake Keowee’s beautiful landscape that mixes mountain views with lakefront living and recreational activities, prestigious private communities like The Cliffs Communities and The Reserve At Lake Keowee offer unparalleled amenities like restaurants, wellness centers, athletic facilities, hiking trails, and so much more. As the only independently owned and operated franchise of Arthur Rutenberg Homes in Upstate SC, American Eagle Builders combines the Lake Keowee lifestyle with luxury custom homes. We currently have one Cliffs Community model home open for private tours and a Lake Keowee model home coming soon. We encourage anyone considering building a lake home to visit our model and see for yourself what Arthur Rutenberg Homes by American Eagle Builders has to offer. 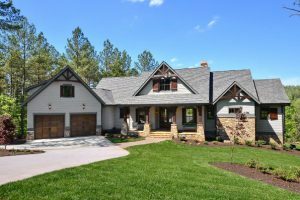 We promise you won’t be disappointed, but we can’t promise you won’t soon be the owner of a beautiful Lake Keowee custom home. Simply fill out the below form and one of our team members will contact you to schedule your tour. The Cliffs at Keowee Falls offers an impressive collection of lakefront properties, including many home sites with waterfront, golf, and mountain views. One of its prized amenities is a Jack Nicklaus Signature Golf Course that was designated as one of the Top 50 Best New Courses in 2008 by Golfweek Magazine. Another amenity of the Keowee Falls community is a beautiful clubhouse located at the top point of the community with an amazing view of 10 out of the 18 golf holes. If you have a passion for nature, fresh water, and untouched forest, the Cliffs at Keowee Falls is a perfect place to build a lake home. Explore 2,500 acres of woodland, 20 miles of private shoreline, and Falls Creek Waterfall, the largest waterfall on Lake Keowee. When planning to build a luxury custom home or lake home in Upstate South Carolina, The Reserve At Lake Keowee is a community you truly must see to believe. The Reserve At Lake Keowee has been meticulously developed by Greenwood Communities and Resorts; who have created some of the most acclaimed resorts and private, luxury communities in the Southeast. As is the trademark of every Greenwood property, The Reserve At Lake Keowee was developed to respect the land and enrich the lives of its’ residents by blending sustainable natural environments, luxurious amenities, and activities/fun for the whole family. WaterSide Crossing is a prestigious residential community situated on 475 acres of woodlands along the shores of Lake Keowee with over 4 miles of shoreline. Residents enjoy temperate climate in the foothills of the Blue Ridge Mountains. Residents live mid-way between Atlanta and Charlotte, with Clemson and Greenville nearby for cultural/entertainment opportunities. Recreational opportunities within the community include a swimming pool, lighted tennis courts and a 1.3 mile long hiking trail. Along the trail are bridges, a brook, playgrounds, clubhouse, marinas and pavilion. Avid golfers can play several 18 hole courses located nearby. Boat slips are available to interior lot owners allowing access to the 18,000 acre Lake Keowee. Welcome to the ideal family playground. The Cliffs at Keowee Springs features a Tom Fazio Signature Golf Course, Beach Club, marina, hiking trails, and the 40-acre Camp Springs all found along the private shoreline of beautiful Lake Keowee. Home to America’s First, Luxury Family Wellness Retreat – The Keowee Springs Lodge and Spa; The Cliffs at Keowee Springs is the perfect community for active families with diverse hobbies and an interest in health & wellness. This luxury home community is quite rare, as many of the spectacular lake views are reserved not for homesites, but for the community’s golf course and amenities. The golf course located at the Keowee Vineyards was designed by Tom Fazio and is described as a “masterpiece” and one of the “Top 10 Private Courses in the Nation” by Golf Digest. In addition to the golf course, The Cliffs at Keowee Vineyards features a club house, wellness center, marina, tennis facilities, equestrian facility, trail system, and the Lakehouse Restaurant. If you’re someone with a zest for life, looking for the perfect lifestyle community for retirement or to raise your family, Keowee Key has more of what you will love. Golf, tennis, fitness center, swimming, and boating are just a few of the amenities this active, secure, lakeside community offers. Keowee Key is one of South Carolina’s premier lifestyle communities nestled in the foothills of the Blue Ridge Mountains in Upstate South Carolina, surrounded by Lake Keowee. Keowee Key Property Owners’ Association, Inc.
Cliffs Community photos and community information are credited to Cliffs Communities.